When Alex and I bought our 1880s row house back in 2003, our home was in a sad state. It had been owned by a string of bachelors that didn't even change light bulbs when they burned out, let alone keep up with regular maintenance or (gasp) attempt home improvement projects. The last major renovations had taken place in the early to mid 1980s, which included work to our kitchen and two bathrooms. As 24 and 25 year old "kids" (that's how our neighbors referred to us), we sunk the small savings we had worked to build into the down payment of our home, so the initial improvement budget we were left with was about enough to buy a packet of ramen noodles. But we weren't deterred. So with what little money we had, we knew an inexpensive update to our kitchen and adjacent sun porch was one of the first projects on our list. What we were dealing with was a beautiful heart pine floor so badly neglected that bare feet in the kitchen meant you'd soon be picking splinters out of your toes. The counter tops were a hunter green laminate (not our choice to begin with) that were scratched and stained. The insufficient lighting consisted of a fugly ceiling fan/light combo that appeared to be no newer than 1970. 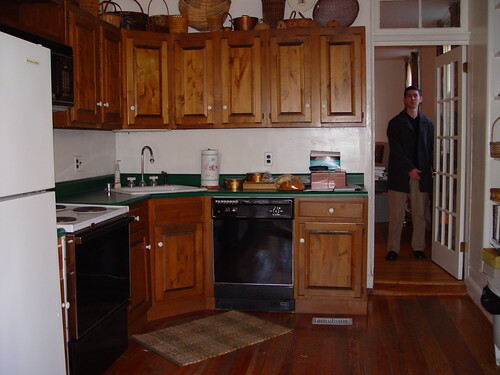 The cabinets were dark, dated, and lined with a hideous contact paper. The walls were dirty, cracked, and nicotine stained. The tile floor of the sun porch featured a brown, tan and orange pattern that made me want to put on some Bee Gees and get down. All in all, it left a lot to be desired. ...using a ramen noodle budget, a lot of elbow grease, and reusing or reinventing what we had. Why show you the kitchen and sun porch now? Well, a few reasons actually. First of all, we hope someone out there can benefit from reading about some of the cheap-o and creative projects we undertook. We want to show that even if you don't have a large budget, there are still a lot of inexpensive things you can do to improve the look of your home. Second, you may recall that one of our 2012 resolutions is an overhaul of our sun porch to update the window treatments, floor covering, furniture and layout. Well we'd be remiss if we started in on that project without showing you where we were, and where we are now. Buckle your seat belt because it's going to be a bumpy ride that involves rodents, structural deterioration, water infiltration, termite damage, fast food, and a lot of naivete. 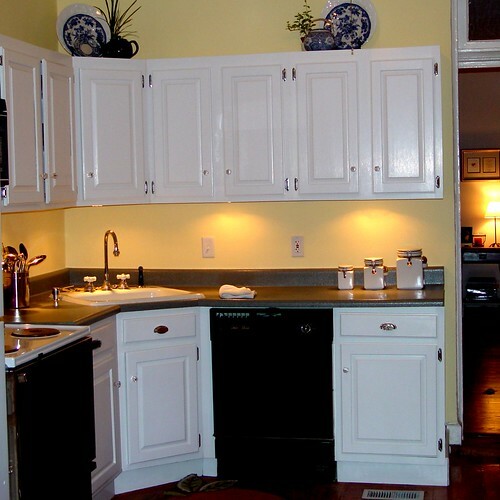 Has anyone else tackled a kitchen makeover on a shoestring budget? Is anyone else living with a kitchen that's better suited for another decade, while saving up the funds to do it right? Any quick and easy tips you'd like to share on how to improve upon what you have? We'd love to hear your stories. Our kitchen is my favourite room in the house, despite it not being even close to "finished". It's huge, just like a farmhouse kitchen should be, at 15'x19'. The original hardwood floor is either oak or maple - we can't tell right now because it's SO dirty (probably oak, though). We have some patching to do before we can refinish. It's incredibly open, and we have a lot of different pieces in it because there's only 4 upper cabinets and 4 lower cabs. It looks better than when we moved in, but we still have a long way to go...too bad it's the last room on our list! It sounds like it has amazing potential! 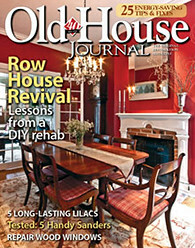 Did you see the series on HGTV with Sarah Richardson when she made over a farmhouse? The kitchen was AMAZING, and might give you some good ideas. My kitchen has vintage countertops - red lino with stainless edges. Once the bathroom is done (for the moment) and the bedrooms are painted, I'm going to rip out the stick down tiles and ruined sheet goods under them. I doubt (jugdging from the bathroom) that the hardwoods run under there, so maybe cork or real linoleum. I'm also planning to paint the cabinets. They are still in good shape, but whatever finsh they had is worn. Plus there's SO much natural wood in my house and the little galley kitchen is so small. It just needs to lighten up. I'll be putting in a dishwasher and some open shelving. There's a vintage fixture that may be replaced with a "schoolhouse" pendant. Lots of plans to make. Wow! Sounds like a great plan. The open shelving and lighter cabinets sound like just the thing to brighten up the space. And I love schoolhouse pendants! Our kitchen started out life as three rooms: the main kitchen, a small butler's pantry, and a small mudroom on the back that was big enough to hold an icebox. The walls were knocked out and the back staircase sacrificed in the early 1960s in a half-witted attempt to "enlarge" the kitchen, though the end result was an awkwardly shaped room with a ton of wasted, unusable space due to the placement of the doorways, windows, and radiators. You had me at back staircase! What I wouldn't give to have a home with a butlers pantry and second set of stairs. Your plans sound incredible and it seems like we're on the same "let's wait a decade for the real deal" plan. :-) I figure by the time we have the money for the new kitchen, we'll know exactly how we use the space and what the best solution will be. We've been a vacation resort on occasion here as well. Old homes with lots of entry points I guess. One more reason we miss our dog Oliver -- he was one heck of a mouse hunter. Mel needs to polish up his skills. What brand and color name is the yellow paint that you used in the kitchen? Oh, I am so delighted to have found your site! I've jotted down directions to strip old doors (I have five old ones on my back porch just waiting to be used in projects! ), how to remove old paint from metal hardware, and how to cut old glass to make new panes. All of these are projects waiting my attention - thank you! I moved into a 100 year old home that had been vacant for over 11 years just last summer. To say it needs a little help is an understatement but it's been a labor of love as I've dreamed of a fixer-upper since I was a little girl. 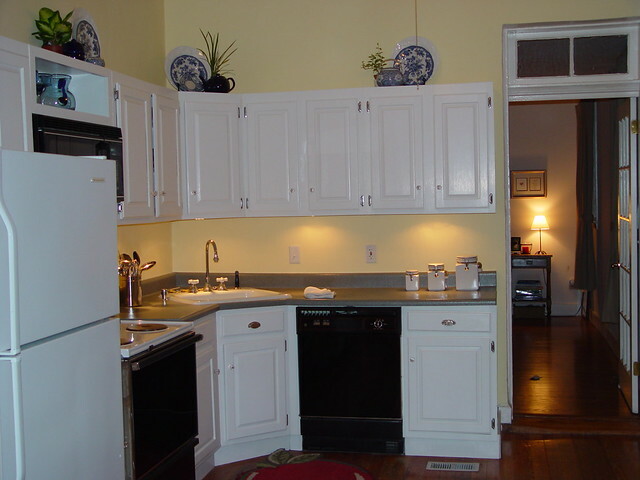 You asked about kitchens. I have an old wood cookstove in mine that took the better part of a day to take apart and clean. I'm sure the flue is a mess. But, I can now use the oven for pan storage! The colors of paint in the house are typical of local homes this age - a sort of dusty rose and a kind of turquoise greenish color. It's actually growing on me (like mold?) but I do look forward to changing it some day. The dining room is my favorite - Craftsman style molding, lots of windows on two walls. I can just imagine how beautiful it will look when I'm done cleaning old paint from woodwork and giving the walls a fresh coat of period color paint. But I want to thank you so much for sharing the joys of owning an older home and providing such wonderful detail for me, for I'm doing as much of the as I can work myself. Enjoy your new old home!